I recently received a request from a friend of a friend to provide advice about installing solar panels at her new home in Denmark. I am a people-pleaser – always one to help. But solar contracting is so specific to the country, state, and even city in which you live. I was able to provide some general help, but ultimately recommended that she find a reputable local solar dealer to take on the project. Solar homes in Florida have unique requirements and a local contractor is your best source. The common refrain is how a client has a brother in New Jersey (or somewhere else) who is an engineer and they have solar and so they are the expert. Ok, I’m being a little flippant about that, but it’s true. And it’s totally reasonable to rely on trusted family and friends. The problem is, New Jersey is another world when it comes to solar energy. Regulatory differences for interconnecting systems. Legally allowed financing alternatives and contractual arrangements between installers and property owners. Financial incentives offered by states and utilities. Utility rate schemes, time-of-use metering, and tiered rate structures. Roof types and construction standards. Serviceability of specific systems by many contractors. These factors can drastically skew the economic viability of a given system. For example, batteries may be viable, advantageous, or even required in some areas. There is no economic argument for batteries in Florida (although there is arguably an environmental case to be made). And we know full well that your cousin in Pennsylvania hasn’t seen hurricane-force winds in a while. There are not a lot of people from California in Florida, but California’s booming solar industry and high concentration of suppliers tends to get a lot of attention in the press and through online search. We see lots of do-it-yourself information that doesn’t necessarily apply to Florida. For example, people ask us to install wholesale solar products purchased online, but the kits usually don’t include enough attachment hardware and often rely on light rail solutions that are not appropriate here. And do you want to install a brand that is not common in Florida, where serviceability could be compromised? Wouldn’t it be better to rely on brands that are commonly available through local supply chains? My HOA doesn’t allow solar panels. You can’t go off-grid in Florida. It’s best to lease solar panels. You can have solar panels installed for free. Corrosion is a serious problem in Florida. Solar panels cause roof leaks. Solar panels will cause my roof to come off during Hurricanes. You can install a ballasted system with no roof penetrations. You have to tilt solar panels for them to be effective. Florida is too cloudy for solar panels to work effectively. All myths, or flat-out falsehoods with respect to the Florida solar energy market. Especially the last one, which was perpetrated by utility lobbyists and repeated by politicians who have no clue what they are talking about. Dispelling myths is just part of the job. As frustrating as it is, our best clients are the ones who choose to educate themselves and seek confirmation of what they are told. We love to answer questions, even if they originate from dubious sources. 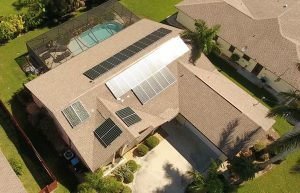 Florida is a very unique solar energy market, historically dominated by solar thermal technologies, especially solar pool heating. Pool heating is still a very effective and affordable option for people. Solar electricity is also really heating up, no pun intended. Your local dealer will understand the local market and guide you accordingly. We can also look at hyper-local considerations. You might think that any Florida solar contractor would be fine to use for your Southwest Florida solar project. You may be mistaken. Florida is an interesting case in that the coastal areas have very high design wind speeds. From an engineering and installation perspective, this has huge implications. A dealer from Orlando has far lower requirements than coastal dealers. Even Tampa solar dealers contend with far lower wind speeds. 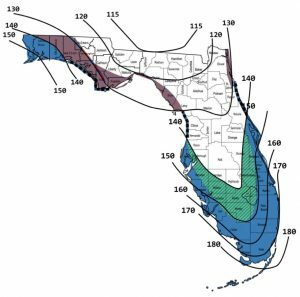 Check out the Florida wind speed map that engineers and installers are required to use to meet Florida Building Code. Coastal areas of Southwest Florida can fall into the 180 mph band while Tampa is under 150 and central areas of Florida can dip below 120 mph. That’s a huge difference in installation and equipment requirements! Moreover, local knowledge of building departments, inspection procedures, serviceability factors, roof brands and types, and other hyper-local factors can make your installation much smoother when you select a local dealer. By local, we mean someone with a warehouse (not a sales office) located within 50 miles of you. People rarely select a cabinet maker, carpenter, or air conditioning company from out of the local metro area. So why would solar contracting be any different? If you want your solar dealer to be there for your when you really need them, a local preference is the only way to go. There are not many products made in Florida. We do offer a Florida-made solar pool heating product (which happens to be the best on the market). Most solar electricity products come from out-of-state. If you can’t find a product made in Florida that suits your needs and budget, that’s probably fine. But a local dealer that supports the product they sell is critical. Fortunately, state licensing means that you won’t find many soalr contractors that are based out of Florida servicing the residnetial solar market. There are national players out there, but they aren’t very interested in Florida due to regulatory hurdles and the lukewarm solar market here. But things are heating up, and you will start to see the big players come in. There will always be a place for local dealers like us who are dedicated to long-term support of the industry and our clients. Beware the larger companies that move in to make a quick buck and move out when the market dries up. We are in the solar industry for the long-haul, built on a foundation of providing Southwest Florida consumers what they want, not what we want to sell them. Keep your business local, and support a local solar contractor like Florida Solar Design Group!